I must admit that over the years I have had some dental issues and a fear of the dentist. This has led to some time when I have not gone to the dentist out of fear. Let me tell you this. Never let fear stop you from going to the dentist. It will lead you down a very expensive path. I lost three teeth in an accident (not car, stupid childish accident) when I was 17. Then I just recently lost a couple of more teeth due to stupidity. I brush, but flossing is an issue for me, it is difficult. I was afforded the opportunity to try out a new brush to review the other day. I normally use the Sonic Care brush system, which I have been extremely happy with. But I did want to give this a trial because I would love to have this for travel. The Arm & Hammer Spinbrush™ Sonic Pulse Battery Powered Toothbrush delivers sonic pulsing action that helps to gently remove two times more plaque in hard to reach areas. The extra slim handle design fits easily in your hand and has the power of a battery toothbrush with the same control as a manual toothbrush. The toothbrush heads are replaceable, which is not true of other battery operated toothbrushes. Comes in soft bristle format. It works with any toothpaste on the market. The toothbrush has one setting, on and off. What is plaque and why it is important to remove it? Plaque is a sticky film of bacteria on teeth that reacts with sugar in foods to produce acids that can attack and weaken tooth enamel. Unfortunately, this can lead to cavities, gingivitis or worse, periodontitis (a more advanced form of gum disease that can cause tooth loss). The solution to avoiding this is to brush twice a day, floss daily, and make sure you are using a fluoride toothpaste to help protect teeth from decay. Visit the dentist regularly for professional cleanings and oral exams. 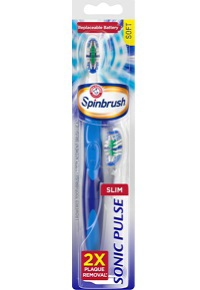 The Spinbrush removes 2x more plaque than a manual toothbrush. This should want to make you get it for sure! Why a power brush? Dentists recommend using a power brush over a regular manual brush and that you brush for at least 2 minutes. This brush removes up to 70% more plaque than brushing with an ordinary manual toothbrush. It is also a great option for your kids. It actually increased the amount of time kids spent brushing their teeth by 36%! * *(vs. a manual toothbrush. Data on file with Arm & Hammer). Here is my experience with the brush. Normally I have some issues with my gums bleeding a little. I was lucky enough that lately they had not been bleeding at all and seemed to be better. This was due to an unfortunate situation where I had to wear Invisialign retainers for over a year while I waited for my partial denture and they irritated my gums. So my gums seemed to be better but when I used the Spinbrush my gums bleed like crazy. I called my dentist and she told me I was pressing down too hard while I was brushing. I am so used to the Sonicare, which makes you lazy because it brushes your teeth for you, I was whacking my teeth to death. Once I lightened up on the brushing, it was fine and things were better. I am going to keep this for travel, since I have my Sonic Care brush, which was very expensive. But this brush will be excellent to take with me whenever I go anywhere overnight, since I cannot take the Sonicare. And I really do like the way it brushes, it leaves my mouth feeling clean and my teeth feeling sparkling clean. I think it removes a lot of plaque from your teeth, definitely more than a manual toothbrush does. The Arm and Hammer Spinbrush Sonic Pulse Battery Toothbrush retails for $10.99 and can be purchased at any mass market store such as Walgreens, Rite-Aid, CVS, Target, Walmart, supermarkets and other pharmarcies. Like Arm & Hammer on Facebook: https://www.facebook.com/armandhammer and Subscribe to Arm & Hammer on YouTube: https://www.youtube.com/user/AHBakingSoda.